There are moments and places that speak to me out of their simplest, most elemental nature. It could be the light – as it often is for me – or their form; mysterious, pure, layered, intricate, organic, ancient… This sunny space between two dark buildings announced itself, as places often do, by making me gasp when I turned into the lane, and when I gasp I know I am in the right place, or the right moment. I trust that gasp to be something from my source speaking without words. Words come later, but in the moment there is only the intake of breath that means, Now! These simple forms; the house fronts in the light, the pair of quintessential Tuscan trees, the cypress and the pine, the face full of ivy on the building on the left, that flawless blue sky, the blush of pale color on the sunlit facade, all of these ordinary facts combined to make something ineffable, yet felt with the precision and economy of a Haiku. 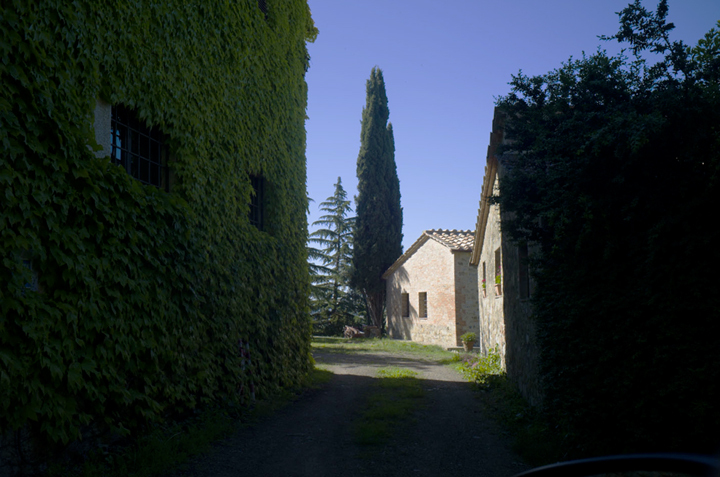 This entry was posted in Light, Tuscany and tagged House, Landscape, Light, Trees, Tuscany, Wall on May 14, 2015 by joelmeyerowitz2014.